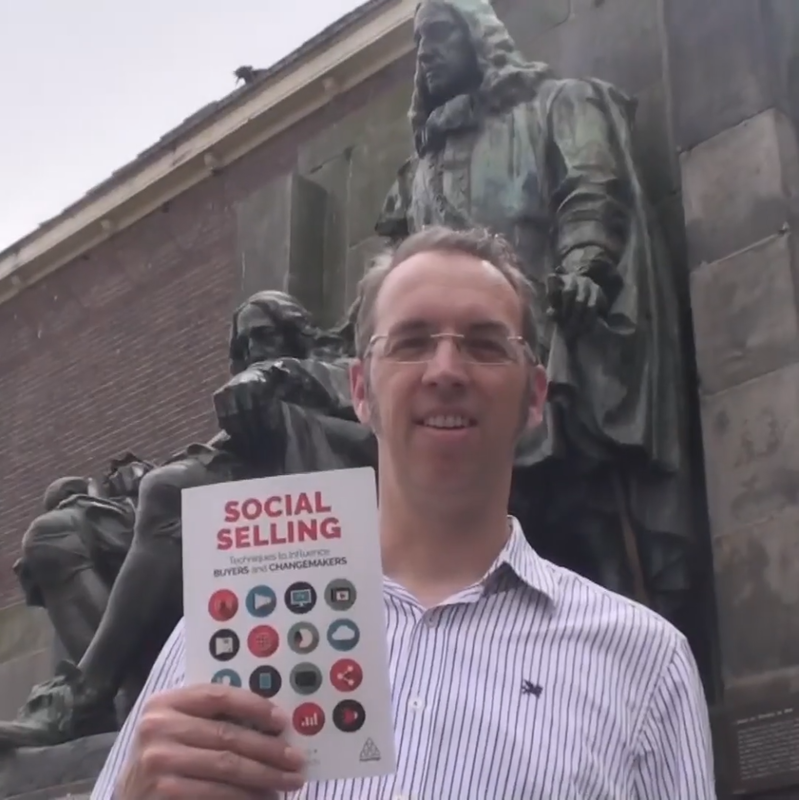 Today my paperback copy of the social selling book arrived by snailmail, and it took me a whole day to make a 7 second video to post on Twitter. After following Tim Hughes and Matt Reynolds on Twitter and LinkedIn for a while. I got convinced that what I need for my business is a way of finding potential clients without having taking the sales route that almost all IT Infrastructure companies in The Netherlands do. The route that has been explained to me by several sales professionals and the route that most people I know in the industry are using does not work for me. I am talking about the process of arranging a meeting with a (the) non technical decision maker, normally placed in a higher rank or hierarchy, to convince them that your solution is best for their company. For me that ‘conventional’ route does not really cut it, and it never really has. The first problem I encounter when trying to take this route is that I tend to get really technical when talking about potential solutions. This is where the IT manager or CEO of the company feels dumb and out of control and the attending technical person is at best happy that I actually understand the problems, but gets frustrated because he (it’s mostly men) finds out pretty soon that his boss is not up for this kind of embarrassment. The second problem is that I come from a background where I saw a lot of money spent on either stuff that the company I worked for really did not need or brands that where mostly marketing and not much beef around the bones. I have kind of been grown in to IT Infrastructure feeling and living the ‘open is best’ mantra, either on open source or on open standards. And deep down I still feel that you should try to find the best fit for a solution to a problem. Put differently: I don’t see why a company should spend $200.000 on a closed source A-brand vendor all flash array that can do metro cluster when they can easily reach all their goals with an $80.000 software defined all flash solution provided by Inprove IT. And yes I know that spending $20.000 on Inprove IT to customize and tune it sounds like a lot of money. But if you end up with a tuned and managed system, that does the same job as the closed source A-brand vendor solution, at half the price then I think that is better for your business, and I will not be able to shut up when the time has come to express that opinion. And here is a method, a way of doing what I aim to do, sell perfectly fit solutions to businesses that can appreciate them and grow on them, that is actually fun! This fits with my roots completely: My mothers family is a family of teachers, my grandfather was headmaster on a primary school, my grandmother taught on that same school. My fathers father worked as chief for a textile factory and my fathers mother was kind of an artist and an idealist for sure and a real communicator. Social selling puts it all together: the integrity and sharing you need as teacher, the personal communication skills that go with that, the business drive and the artistry and idealism you can not miss one of them if you want to do this right. So I am going to be social selling for Inprove IT Infrastructure Solutions and ProcoliX Managed Hosting and of course for myself and my personal blog. I am up for it! I know one thing for sure: this is going to be fun! Not only for me, but also for all those people that I will be working with and for, since now I can and must be myself in order to become what I want to be. And on that philosophical bombshell I am calling it a night! Good night.